We extend our apostolic benediction, benevolent prayers and greetings to our brethren, His Beatitude Mor Baselius Thomas I, Catholicos of India, and their Eminences the Metropolitans; our spiritual children: Very Reverend Corepiscopoi, Reverend priests, monks, nuns, deacons and deaconesses and the entire blessed Syriac Orthodox people all over the world. May the divine providence embrace them through the intercession of the Virgin Mary, Mother of God, and St. Peter, Chief of the Apostles, and the rest of the Martyrs and Saints. Amen. 2015 will mark the first centennial commemoration of the genocide of our Syriac people, “Sayfo”. In the early twentieth century, during the Ottoman Empire rule, our defenseless and unarmed forefathers and mothers were killed by the sword. More than half a million Syriacs were massacred along with Armenians and other Christians. Those who survived were expelled from their homes and lands, their properties were confiscated, their dignity was violated and, in many cases, they were forced to renounce their religion and faith. Churches were turned into either stables for animals, restaurants or factories; the aim of all these atrocities was to erase all signs of Christian presence in the region and to plunder the properties and wealth of Christians. We have truly become children of martyrs in very East where we, the Syriacs, made immense contributions in order to spread civilization, culture and faith as we are people known for their love of science, progress and strong determination despite all our tragedies. All these tragic events were carried out by both the Ottoman state and the local people who stained the history of the region with suffering and misery. Our neighbor drove his Christian neighbor to death, exposing him to killing and persecution for no reason and with no justification. The Syriac people became known for enduring tragedies and becoming victims of conspiracy and complicity in an organized persecution designed to suppress and even annihilate them. A whole century has passed since the massacres of “Sayfo”, and the wounds are still bleeding. In witness to her martyrs, the Syriac Orthodox Church is committed to take a historical stand and to awaken the conscience of humanity which is in a state of deep sleep, unaware that he who remains silent about the truth is a partner in the crime. The Church has made it a duty to remind the world of one of the most disgraceful and ugliest crime of the twentieth century. This genocide will not fade away from human memory as long as there is someone who sheds light on it to open the blind eyes and deaf ears which we ought to wake up from the forgetfulness in which the international community has assumed. Can we ignore a genocide that was the main reason of uprooting us from our land, destroying our churches and violating our honor and dignity? After one hundred years, both killing and destruction continue: Christians are targeted anew and it seems that there are neither international covenants nor adequate legislations that protect the basic human rights of Christians. Moreover, it appears that the world lacks pity for them or is simply unconcerned. Each crime committed is crueler than the previous one. How little has changed since Sayfo. During this year’s summer months, the people of Mosul were displaced from their city, and the citizens of the villages of the Nineveh Plain were uprooted from their forefathers’ land. Our Syriac people are once again wandering about, seeking a place to settle down and live in safety and peace. Furthermore, our community in Syria is suffering from the tragedy of war. Tens of thousands have left Syria and have become refugees in different parts of the world. 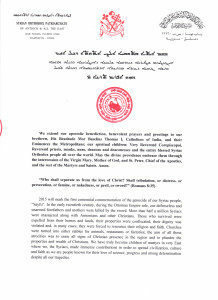 Dearly beloved in Christ, in the meeting of the Universal Holy Synod of our Syriac Orthodox Church of Antioch, which we presided over on May 30, 2014, we have decided to dedicate the year 2015 for the commemoration of the centennial of the ‘Sayfo’ genocide, the massacres committed against our Syriac people. Therefore, we have formed a Patriarchal Committee to prepare for this occasion and to coordinate with all concerned in order to organize seminars, lectures, art exhibitions and recitals. We will open the centennial year by celebrating the Divine Liturgy at our Holy Apostolic See in Damascus on January 11, 2015, and then in Lebanon on January 18th. Several activities will accompany the opening of the centennial year. The Patriarchate will also participate in celebrations and activities in Sweden, America, India and Rome during the course of the coming year. These celebrations will convey a clear message to all humanity: the Syriac people are not extinct, they will not be defeated and they refuse to surrender to humiliation and murder; they want to live. The aim of this commemoration is not to harbor hatred or animosity; rather, it is to show faithfulness to the memory of our innocent martyrs and to remind ourselves and all future generations of the cruelty of what happened so that our people or any other people may never face similar massacres again. 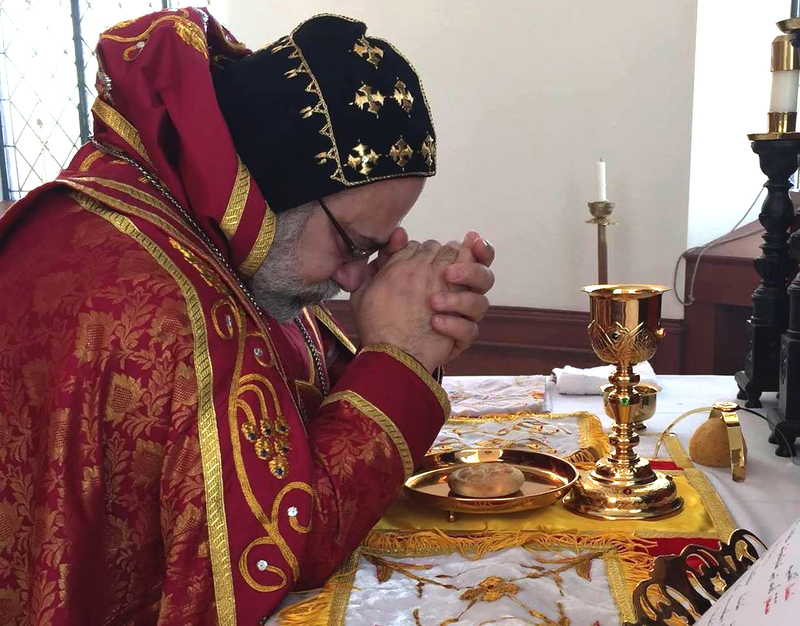 As we prepare to celebrate this major occasion, we ask our Syriac churches throughout the world to dedicate the celebration of the Divine Liturgy on one of the upcoming two Sundays for the intention of this centennial observance. We also encourage our spiritual children in all our parishes to offer prayers and celebrate the Divine Liturgy in remembrance of all the martyrs of the Syriac genocide. We likewise invite all our brethren the Archbishops to set a program for appropriate celebrations and suitable activities during the year 2015. We pray the Lord to have mercy upon the souls of all martyrs, especially the Syriac martyrs of Sayfo. We implore the Lord, for Whose sake those martyrs have sacrificed their lives, to keep all those who believe in His name away from the bitter cup of suffering and to spread His peace and security throughout the world, especially in the suffering East, through the intercession of the Virgin Mary, Mother of God, and all the martyrs and saints. Amen.